Xicui brought with her a two-meter squared, double layered silk brocade and a golden color sketch of the two phoenixes. As for the embroidery thread and needle, it was not provided by the Embroidery House and had to be self-provided. “Shuilian jie*.” Xicui softly said with her head down, clearly ashamed. “It’s ok, three days should be enough. Come, let’s go into the embroidery room, we should start immediately.” Su Shuilian grasped onto Xicui’s hands and had her put her basket of embroidery items to the side before leading her to the kitchen to wash their hands. When Xicun saw that Su Shuilian did not blame her, she quickly sorted out her feelings. After she fixed her skirt and washed her hands, Xicui followed Su Shuilian into the embroidery room. Su Shuilian then lit a sandalwood incense, and opened the basket that contained Zicui’s embroidery. Xicui nodded in contentment, she picked up the needle and was about to begin. “Don’t be anxious, take your time and try hard not to make any errors.” Su Shuilian softly soothed. When they began, if any mistakes occurred; it would take even longer to finish; and may even affect the finished product’s overall appearance. Although she did not ask about how much the fee would be for an incomplete or unsatisfactory work, from both Aunt Lao’s and Xicui’s looks; she could guess it was not a little amount. This was her first time embroidering such a big piece since coming to The Country of Dahui. Previously she had embroidered mandarin ducks on an celebratory blanket, pillow cases, pillow towels and wedding veil. She also embroidered the four noble plants: plum flower, orchid, bamboo and chrysanthemum on both Lin Si Yao and her own clothes. The most complex needlework she did was the single-sided double stitch*. But those were made on her own accord, and there was no pressure in making them. However, this time it was different, this Paired Phoenix Embroidery had to be double sided. Compared to the single sided embroidery, this was much more difficult. According to the sketch, the two flying phoenixes under the crescent moon, beside the coiling branches, must have slender, yet clearly-in-motion feathers. The needle in Su Shuilian’s hand remained motionless as she was deep in thought. When Su Shuilian saw Xicui had already started on the branches, she curved her lips and lightly suggested: “Xicui, if you use the Stem Stitch Filling (旋針) or the Long and Short Stitch (長短針), the colors will be more realistic.” After all, the embroidery sketch on the paper had a very realistic ink painting on it. If the finished piece did not have the charm or grace portrayed in the sketch, their wages may be deducted. “We have enough time. We have to split the work; so we can make it on time.” Su Shuilian nodded at Xicui: “If we don’t make it on time, I will compensate you for your loss. But since I made this promise, we should both put in our best effort.” Su Shuilian felt an inexplicable sense of respect and dedication. If it was just to cope, she would rather pay than to not embroider. And because of that, Su Shuiyan would always overtly and subtly call her stubborn and inflexible. Flexible? She was indeed not flexible. 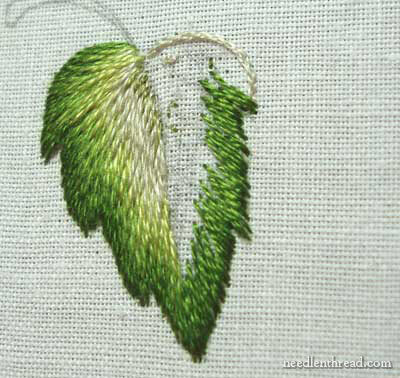 For her to transfer a pleasant freehand ink painting onto a large and expensive embroidery silk. To embroider using simple and easy techniques instead of the complicated and realistic stitches, she, Su Shuilian, could not bare to do such a thing. And it is because of that, she was able to keep the five-year consecutive title of “The Chief Representative of Su Embroidery” and reputation of a first-rate maiden embroider. This was why Su Shuiyan was unable to achieve this. But now, that Su Shuiyan should be representing Su House on her behalf during this year’s widely prestigious Su Embroidery Contest. Su Shuilian shook her head focusing herself and began to embroider on the silk. Xicui felt calmer after listening to Su Shuilian. She took out her previous stitches and picked a more complicated, but more detailed-abled stitch. After finishing a few stitches, Xicui wanted to get a broader look at the stitch. However, when she looked up, she was enchanted by Su Shuilian’s concentrated look. A beautiful yet not gaudy face with a tranquil expression, the needle in her hand moved quickly with no hint of impatience. Under the sunlight that had shone through the crevices of the rolled down curtains, the image was extremely moving. Not to mention men, but an unmarried girl like her (Xicui) was shocked by this scene. No wonder her aging mother; Aunt Tian, and the other poniang were always endlessly admiring her… This kind of woman, who would not want her to be married into their house to keep and pamper? Xicui’s heart was full of praise, unconsciously she straightened her back and tried to imitate Su Shuilian’s posture and action. In her heart, she had already decided that before she got married, she would spend more time with Su Shuilian. It would be beneficial to learn from her impressive needlework or her ladylike posture. She had to make sure that her future husband would be like how Lin Si Yao treated her. Lin Si Yao put down the wooden watering can and turned around before nodding: “Take it back, they’ve already ate mantou for lunch.” Lin Si Yao reported as per Su Shuilian’s request before she entered the embroidery room. “Ah? How can that be, it’s better to eat some rice and vegetables. Look, I’ve even had Cui’er’s father buy a kilogram of meat from the city and made pork stew with it.” Aunt Lao raised the basket in her hand. She paid no heed to the wolf puppies that had heard the word ‘meat’ and were drooling while circling around her legs. “This was Su Shuilian’s idea, she was afraid that they would waste time eating.” Although Lin Si Yao’s face displayed indifference; internally he was impatient. They had just gotten married and their early days were been ruined by those meddlesome poniangs. Although Aunt Lao had really helped them multiple times, he would rather have paid them some silver taels as thanks. But it was a pity the current him was penniless; all of the spending money was paid with Su Shuilian’s savings. So he could only swallow his displeasure. “A… A waste of time? So they do not plan to eat for lunch?” When Aunt Lao realized the meaning of Lin Si Yao’s words, she could not help but repeat in a low voice. Lin Si Yao nodded his head and then walked into the kitchen. He was about to prepare the mantou and bring them in. “Then… ai, A Yao, I’ll just leave the food here. Whenever they come out is when they can eat it so they don’t starve, okay?” Aunt Lao said as she handed the basket to Lin Si Yao. However, when she saw that he had no intention of receiving the basket, she directly put it into his arms and continued: “Then, I’ll go back now and come back later today…” She quickly turned around and exited the yard. Aunt Lao felt guilty. Thinking about it, it was because of her recklessness. From Lin Si Yao’s chilling aura, she had guessed he had blamed her. But of course, their GuiNing* day has yet to pass and they were already pulled into the mess that her daughter had caused. Anyone else would not be in a great mood either! Aiyo! She really had no brain! Aunt Lao hit her forehead and she mumbled as she quickly made her way back home. Sigh.. how envy~~ with such a doting hubby, who won’t? Crud, auto correct… it turns out i type Luo more than Lin. Now this old lady got it. It was insensitive of them they are being a great nuisance. but at least she realised her mistake. Thank you for this chapter. Ohh wow… HB to you too! The neighbors forgot they were newlyweds immediately after the wedding day. Oh my goodness. Well, it was a sort of financial emergency, and in such a small village, you must all depend upon and help each other through the hard things, or else the village loses survival potential. Still, poor Lin Si Yao, so frustrated, but helpless against his current penniless state, and his inability to deny Su Shiulian anything – even time spent on other people’s concerns. Aunt Lao is not a bad person, I quite like her! LSY is such a cute man! Thank you for the amazing chapter! *snacking on Assassin Farmer cookies* Dish ish da laif! Omnomnomnom! The cookies are so sweet I could mom them all! Thanks for your hard work! I will forever be grateful that you choose to translate this coz I really love the story! Ahah thanks so much for enjoying this novel! Sometimes I wonder why these people are acting so selfish. Aunt whatever her name is realized her mistake. That’s fine. But her daughter, you want to spend time with our MC because you want to learn her needlework skills and lady-like posture? Not because you want to be friends with her? I’m so disappointed with this girl. Not only did she trouble our just after their wedding day, now she’s planning on troubling more. I totally agree with you there!